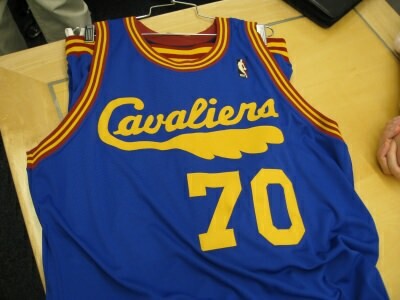 Cavaliers to Roll Out Another Jersey? To throwback or not to throwback? That is the question. The Cavaliers have hit the hardwood in several different jersey combinations this season. Of course, they have their standard home and away jerseys that feature the navy/wine/white ensemble. To throw it back to the days of Mark Price and company, the team takes it back a notch by donning the orange and blue. And of course, like them or not, the Cavs have their “Hardwood Classic” jerseys that feature the true wine and gold (1970-74) from the days that make Austin Carr sit back and reflect…deep in The Q. But those of you that choose to keep your closet up to date with the latest and greatest Cavaliers gear will have another purchase to make in the near future. 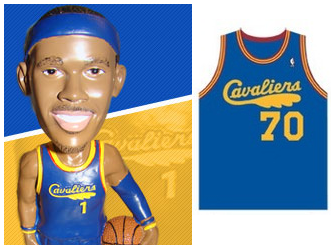 With tomorrow night’s game against the Bobcats featuring the Daniel “Boobie” Gibson bobblehead doll, the team will also be wearing the jersey as seen above. As you can see, it’s more of a neon blue color with gold letters, and red trim along the arms and neck. It’s not exactly the neon blue of the 1994-99 Shawn Kemp Specials, but it’s intriguing to say the least. They remind me a lot of the 1990s Golden State Warriors jerseys, honestly. As with any alternative jersey, there are bound to be mixed reactions. Typically, I’m a fan of anything different as long as it isn’t the old Pittsburgh Pirates gear. Feel free to leave your thoughts in the comments.